Much as I enjoy a festive evening party, one of my favorite ways to celebrate the season with close friends is a Christmas Coffee. I used to do this in conjunction with my Willow House business, but the simple formula works even better for a cozy get-together with a close pal or two. 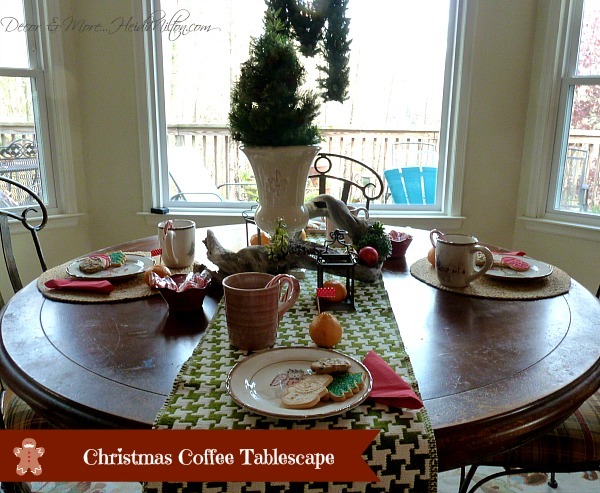 And ever since I spotted some adorable Christmas plates and mugs at Tuesday Morning, I’ve been itching to pull together a Christmas Coffee tablescape to share with you! I kept it super simple, using many things I already had on hand to create this festive rustic table (did I just coin a new term?! 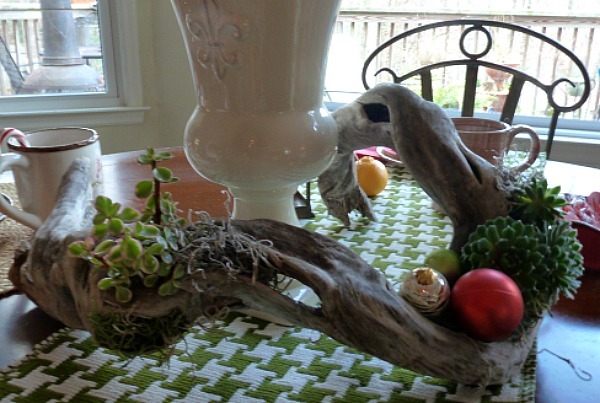 )… like the driftwood I found up at the lake last spring as the centerpiece. I just added a couple of succulents from Home Depot, a little moss, and some small ornaments. I think this is one my favorite centerpieces. Ever. The houndstooth runner is part of the Threshold collection at Target… it was one of those grab-it-when-you-see-it moments. 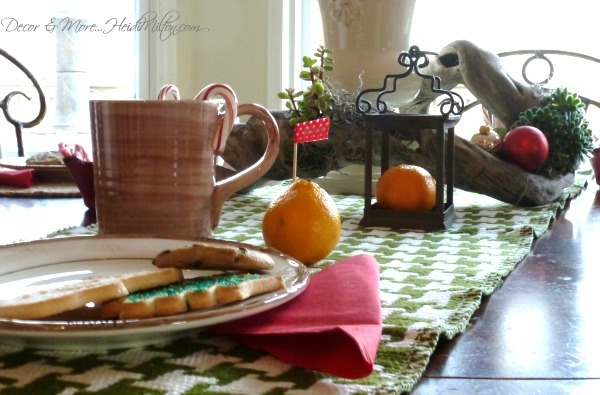 Love the green…The urn is an old Southern Living at Home (remember them?) 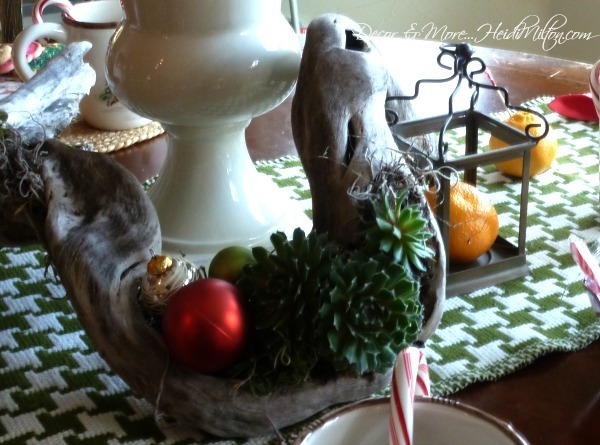 favorite; I just added a small faux table top tree I had in my storage room. These dishes are so adorable… I love the rustic whimsical design! With it being Tuesday Morning, not all the pieces were available otherwise I’d have bought the whole set. But I think having just the dessert plates and mugs is fun, too. Clementines serve as easy place card holders. Just add toothpicks and washi tape to personalize. Love adding fruit to the table no matter what the season. 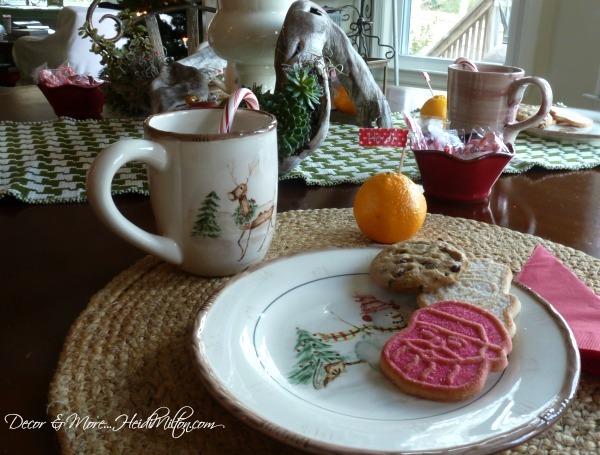 Candy canes add the perfect finishing holiday touch! And to ward off the chill of the season, you’ll want a cozy rug underfoot… like this gorgeous rug from Mohawk’s new American Rug Craftsmen collection. I love the blues, greens, grays in this rug — perfect in my breakfast area. And that it’s American made? Even better. 🙂 I am absolutely thrilled with the quality and craftsmanship of this rug. And now YOU can win your own Mohawk American Rug Craftsmen rug by entering Mohawk’s Pin it to Win It giveaway! Click on the picture above (or HERE) to head to Mohawk Home’s giveaway page and follow the instructions there. 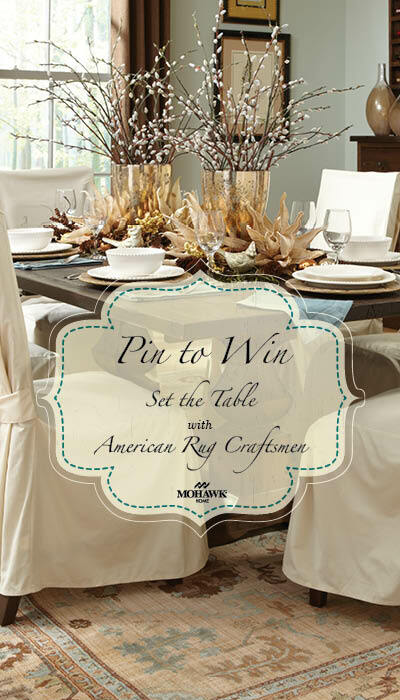 Don’t forget to use the hashtags #setthetable and #mohawkhome when you do your entry. If you have questions about the tablescape, ask away in the comments or shoot me an email. Are you setting the table for a holiday get-together this year? Disclaimer: This is a sponsored post. I was provided the rug for the purposes of promoting this collection and giveaway. However, all opinions are strictly my own. 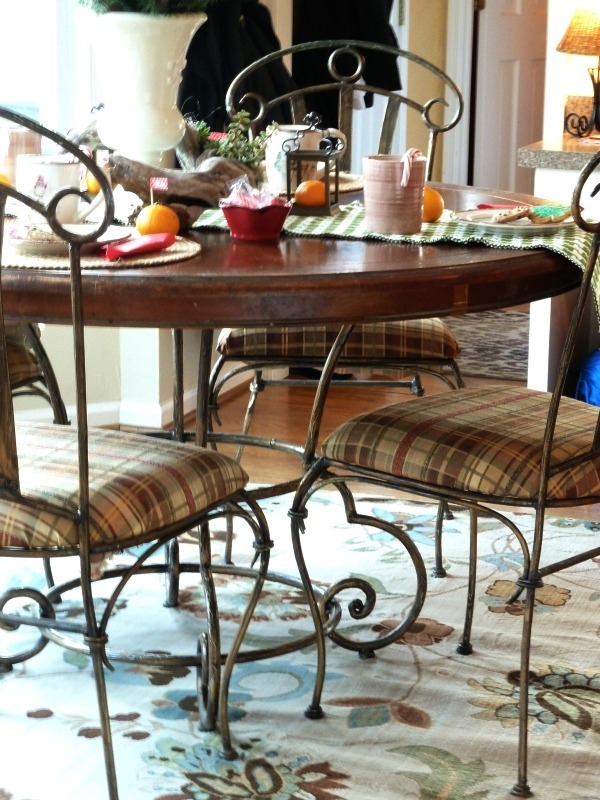 love your table- the houndstooth runner is awesome! So pretty and I absolutely love the new dishes!!!! Gosh, it’s all so pretty! Love the houndstooth. So pretty, Heidi! I’m drooling over that hounds tooth runner!!! 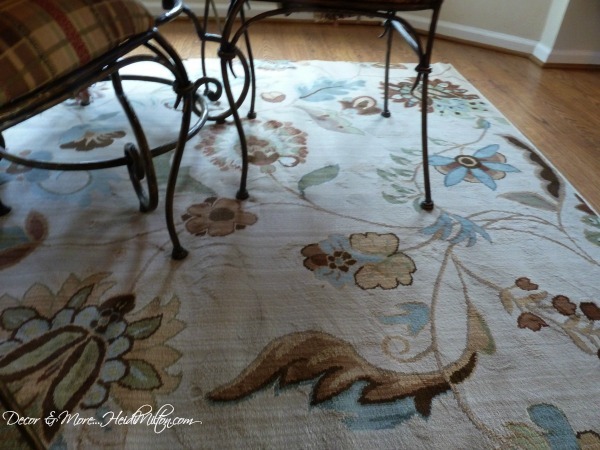 What a great giveaway- your rug is gorgeous! Oh how I love those dishes and your beautiful table and rug! 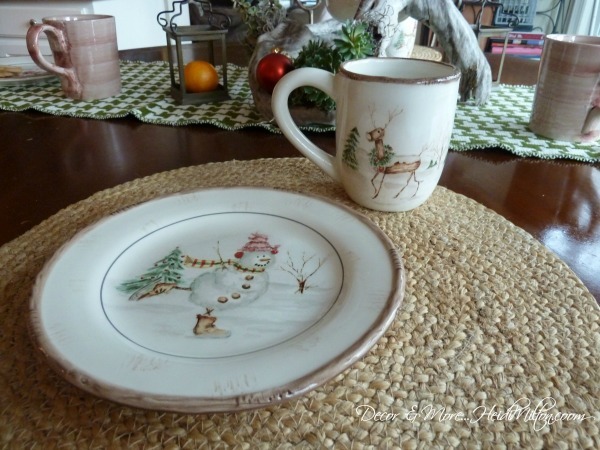 !…Great giveaway Heidi..hopping over!